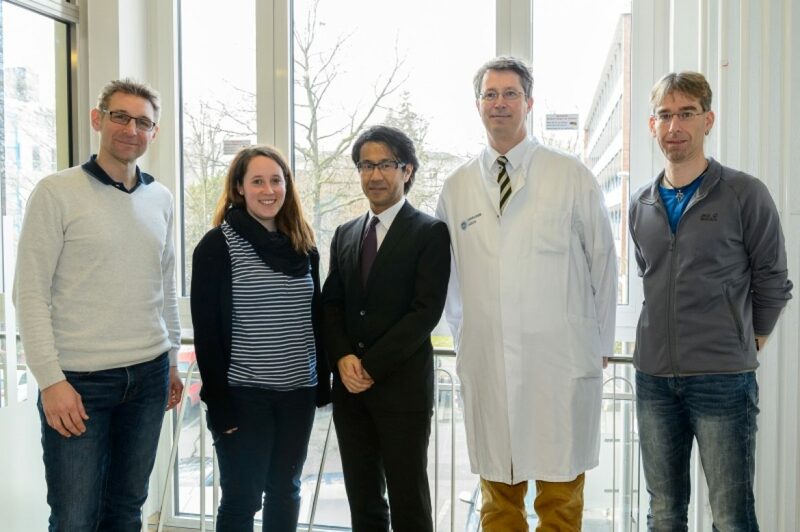 On March 9th, 2018, the DFG Research Unit FOR 2240 hosted Visiting Professor Kazuichi Maruyama. Prof. Maruyama is Associate Professor at the Department of Innovative Visual Science at the Osaka University Medical School in Japan. In addition to his Osaka position, he is a part time Assistant Professor in the Department of Ophthalmology, Kyoto Prefectural University of Medicine, Japan, and Adjunct Scientist at Schepens Eye Research Institute/Massachusetts Eye and Ear, USA. After discussions in a lab-meeting setting with PD Dr. Felix Bock, Principal Investigator of FOR 2240 Project 1 “Induction of corneal transplant tolerance by anti(lymph)angiogenic therapy”, Ann-Charlott Schneider, PhD student in Project 1, Prof. Claus Cursiefen, Speaker of FOR 2240, and Dr. Thomas Clahsen, Project Manager of Project 2 “Identification of novel endogenous modulators of (inflammatory) lymphangiogenesis by analyzing mouse strain-specific differences” (pictured from left to right), Prof. Maruyama (pictured center) gave a lecture with a clinical focus on “Comprehensive analysis of vitreous specimens for uveitis classification”. Uveitis is an inflammatory disease involving a middle layer of the eye.